Will somebody bring him back his money please… and his Maybach, and his Denali, and his Lamborghini. The man born a Shawn Carter has taken his rap career and propelled it to a level of billionaire and entrepreneur. In the making of his music videos, Jay-Z has driven pretty much every over-priced import roadster on the road today. Like a top-shelf champagne his autos are only the best. His real life is not very different. As an ambassador to GMC and an owner of Maybach’s and Lexus vehicles, Jay-Z has no shortage of hip rides. In fact, he could probably have two different cars for every day of the week. 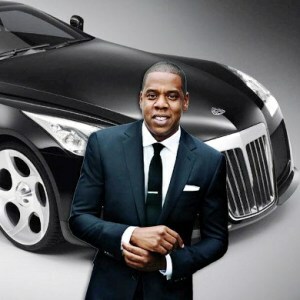 Jay-Z’s taste for one of a kind vehicles leads him to schedule very public test drives – on the sets of his music videos. Go back a few years to “Show Me What You Got” featuring Danica Patrick, Dale Earnhardt Jr. and two rare roadsters: a Ferrari F430 Spider and Pagani Zonda Roadster. And when jay heads back to his roots of Brooklyn he keeps it low-key, by rollin’ through the hood in his Bentley Azure. This luxury ride left such an impression on Jay that he traded in his old school Lexus he once rocked in the 90′s for a Bentley of his own. Now Jay is not all about imports, he respects the domestic brands as well. Back in 2007, the artist joined forces with GM to produce a special edition GMC Yukon Denali. This collaboration lead to the creation of a concept Yukon Denali in ‘Jay-Z Blue’. The car was unveiled in Detroit at the North American International Auto Show, at a pre-opening party held by GMC where top celebrities appeared with 17 new GM vehicles, concept cars and classics. From Bentley to Denali, there’s no way Jay-Z is without a way to drive to he set in style and class. Jay-Z owns one, customized as per his taste Maybach Exelero, is a super luxury car in every sense. Mercedes flagship model is though no longer in production, but its been the preferred car of the rich and the famous. No wonders, Jay-Z too owns one, customized as per his taste. Priced at $8 million, this car has got a special place in Jay Z’s car collection. Jay Z who loves to feature his favorite concept cars in his music videos has recently bring forth his car, the Maybach Exelero in his new video for “Lost Ones.” Undoubtedly, the speed of Exelero is its biggest asset which enables it to cover from zero to sixty in just 4.4 seconds.